Last year a small, black cat made headlines at the beginning of Spanish Football Season when he wandered onto the field immediately after the beginning of the Barcelona vs. Elche match at the Camp Nou stadium in Barcelona, Spain. All eyes went to this amusing and frisky kitty as onlookers and athletes alike were amused watching stadium staff chase him relentlessly for what seemed like a great length of time. 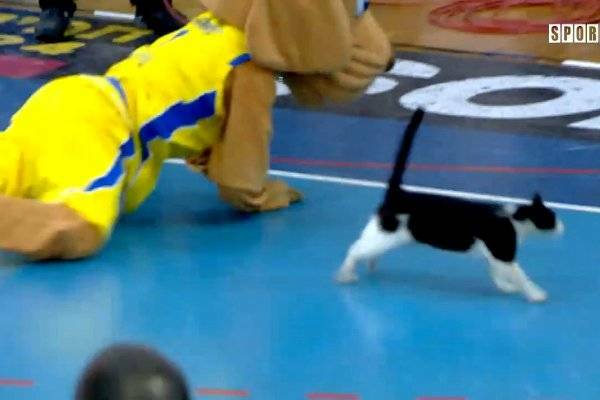 The game's commentator remarked, "We don’t have a rat catcher, we need a cat catcher!" The amusing black kitty's claim to fame was finally over as the crowd roared with applause at his removal. Depending on your perspective, the frisky black cat was bad luck for Elche and good luck for Barcelona, since Barcelona won 3 to 0 that day! The hilarious story is not actually one of a kind. It turns out that throughout history, cats have a longstanding reputation for disrupting important sporting events! Here are our NINE favorite stories over the years. 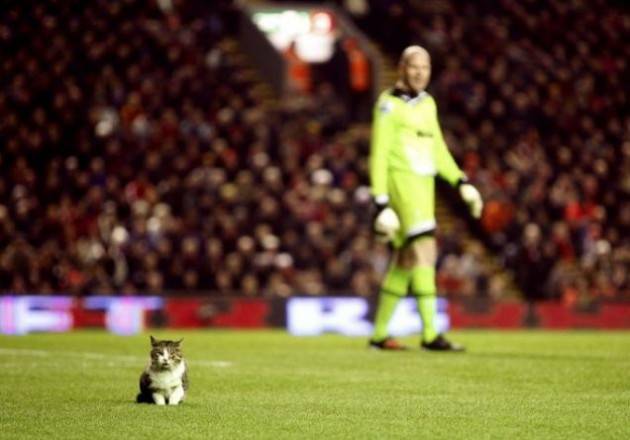 This spunky cat ran on the pitch during the first half of the Liverpool-Tottenham English Premier League soccer game. 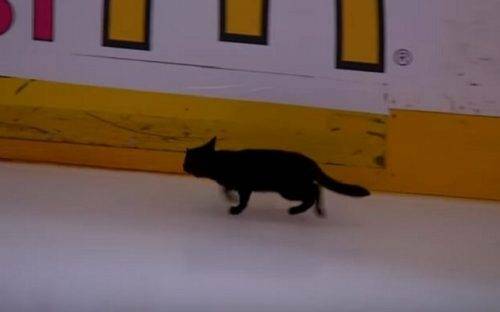 Kitty is pictured here, stopped by Tottenham goalie Brad Friedel and having a quick break outside of the goalie box before seeing his way out. The Red Sox at Mariners, this small grey kitten puts up one heck of a fight when he bit the poor guy stuck wrangling the little distraction. At the WTA Tennis Championships, in Doha, Qatar a cat disrupts a match between Venus and Serena Williams by running across the court. 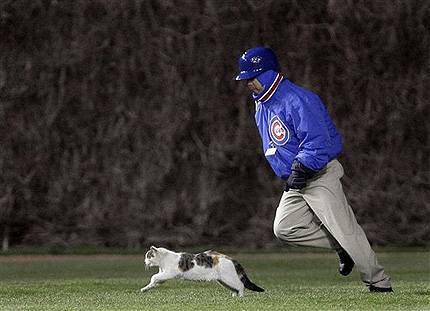 During the fourth inning of a thrilling baseball game between the Chicago Cubs and the Cincinnati Reds at Wrigley Field in Chicago, a security guard chased down this frisky kitty. 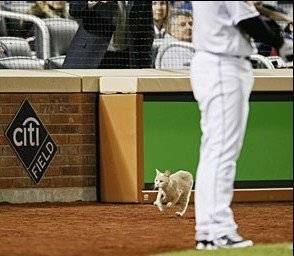 Making his debut at the newly built Citi Field during the Mets home season opener, this orange tabby cat momentarily stole the show! 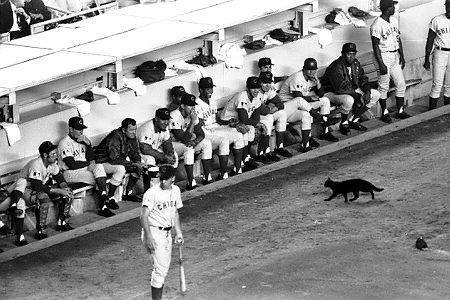 The legend-packed 1960 Chicago Cubs team appeared to be a guarantee that they would beat the Mets and return to the World Series... that is until September 9th, 1969 when a now very famous black cat ran onto the field at Shea Stadium, and left with a reputation for cursing the Cubs. 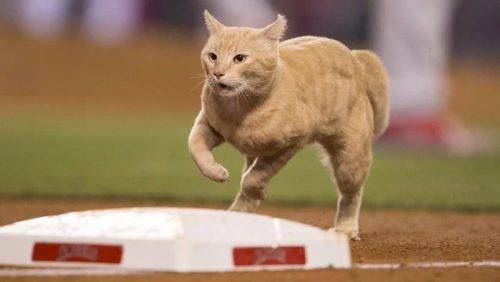 During the fourth inning of a game between the St. Louis Cardinals vs. Los Angeles Angels, an adorable orange cat sprinted out onto the field then ran like crazy through the crowd before an Angels fan finally caught him. Don't worry, the kitty made it safely to a shelter nearby!